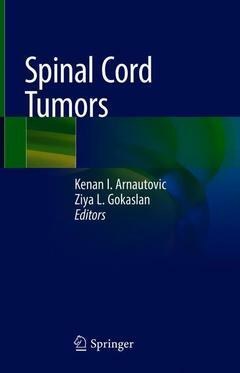 Coordinators: Arnautović Kenan I., Gokaslan Ziya L.
Historical aspects of SCT (spinal cord tumors).- Epidemiology of SCT.- Molecular biology, genetics and pathology of SCT.- Diagnostics and differential diagnostics of SCT.- Intraoperative monitoring of SCT.- Positioning of patients with SCT.- Neuro-anesthesiology considerations in SCT.- Spinal meningiomas.- Spinal schwanomas.- Intra/extradural spinal schwannomas and management strategies.- SCT in neurofakomatosis.- Ependymomas.- Myxopapillary ependymomas.- SC (spinal cord) astrocytomas.- Malignant SC tumors.- Spinal cord metastasis.- Rare spinal cord tumors.- Spinal instrumentation strategies in SCT.- Radiosurgical and radiation considerations for residual, recurrent and malignant SCT.- Complications in treatment of SCT and prevention strategies.- Outcomes in treatment of SCT.- Rehabilitation of SCT. Kenan Arnautovic is Professor of Neurosurgery, Department of Neurosurgery, University of Tennessee, Attending Neurosurgeon at Semmes-Murphey Neurologic & Spine Institute, and Chairman, Baptist Neuroscience Institute, Baptist Memorial Hospital, Memphis, TN, USA. He is also Professor of Neurosurgery, Sarajevo Medical School, Bosnia-Herzegovina. Ziya Gokaslan is Professor of Neurosurgery at Warren Alpert Medical School of Brown University and Chairman, Department of Neurosurgery, Rhode Island Hospital, Providence, RI, USA. After finishing medical school at the University of Istanbul, Turkey she completed residencies and fellowships in surgery, neurosurgery and spine surgery at Baylor College of Medicine, and New York University Medical Center USA. Both Editors have several decades of experience in treatment of spinal cord tumors and have written articles and given lectures nationally and internationally on the subject.